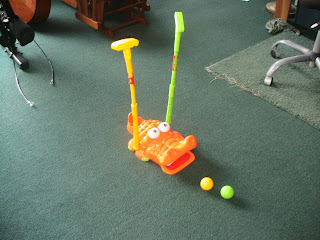 Preparing For Our Children's Future: Hasbro Gator Golf Game Review! I am pretty picky when it comes to buying toys for my children. Most of the toys my kids get are from other people, since I usually decide to spend our money on books! Lol!! But there has been ONE game that I have really been wanting to get them! Yep! Gator golf! Gator golf is tons of fun! I love playing it with the kids! The game comes with 2 putters, two balls and instructions. You can play the game solo or with a friend! It makes a great game for indoors and outdoors! 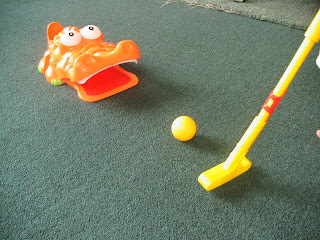 Gator golf is your own mini-golf at home. 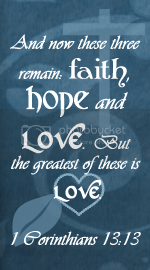 And perfect size to throw in a bag and take on your camping trip, to the park, etc! Each putter has an easy way for players to keep score and the first player to make 4 points wins! The game says for ages 3 and up, but my 1 1/2 yr. old grand baby and my 2 1/2 yr. old love to play it! It is really cute to see them get down and put the ball in the goofy gators mouth! And to see the surprise on their face the first time they see the gator "swish" the ball back out with his tail! It is really neat! He throws it out, overs his head, back in front of him! I give this game 5 stars and Highly recommend it! 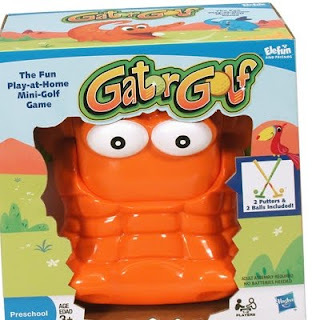 You may find Gator Golf online or in stores at KMart, Wal-Mart, Target and ToysRUs! I also highly recommend that you visit Hasbro.com and HasbroToyShop to find more great toys and games! I love Hasbro toys and remember playing with so many of them while I was growing up! Some of my favorites where Little Pets, My Little Pony, and of course PlayDoh! Hope you have fun with your Gator Golf! It has definitely been one of the best toys for my children!